Viknesh Vijayenthiran April 19, 2019 Comment Now! 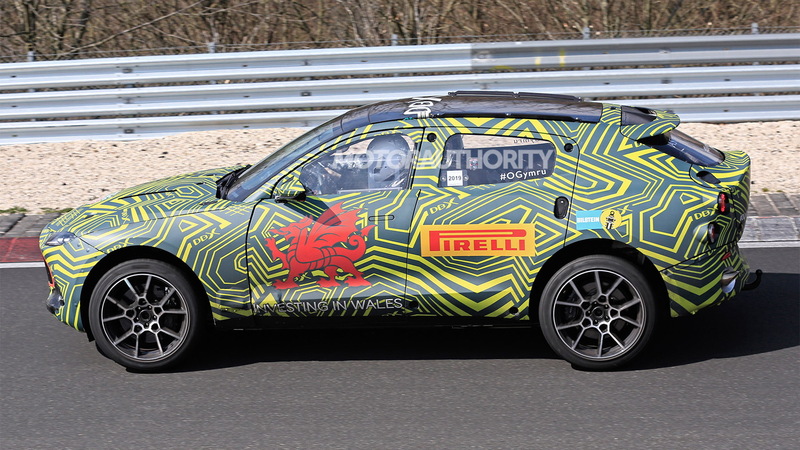 Aston Martin's DBX SUV is on track for a debut in late 2019 and as part of the development a prototype has taken to Germany's Nürburgring for some high-speed testing. 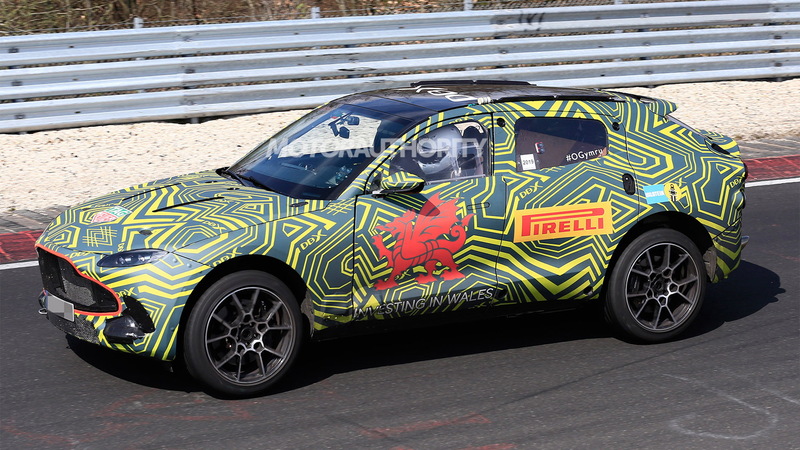 Judging from our spy shots and video, the 4-door DBX will be a small SUV with proportions similar to those of the Alfa Romeo Stelvio. 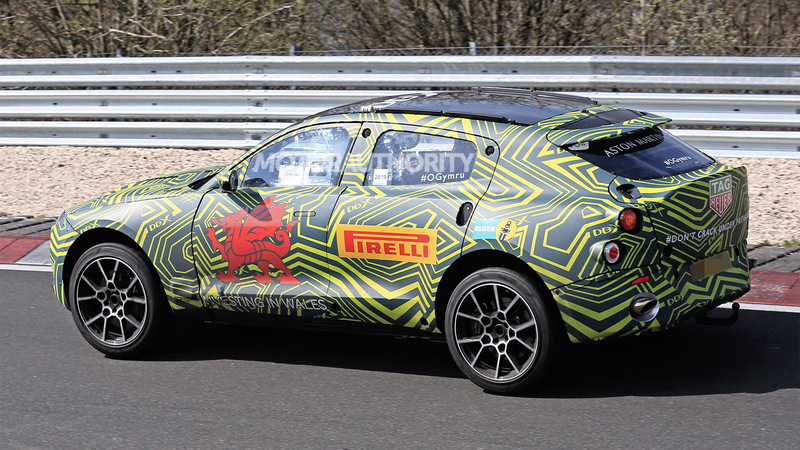 The tester is heavily camouflaged, however, so the final shape won't be as frumpy as what you see here. Expect the DBX to resemble a stretched Vantage on stilts. 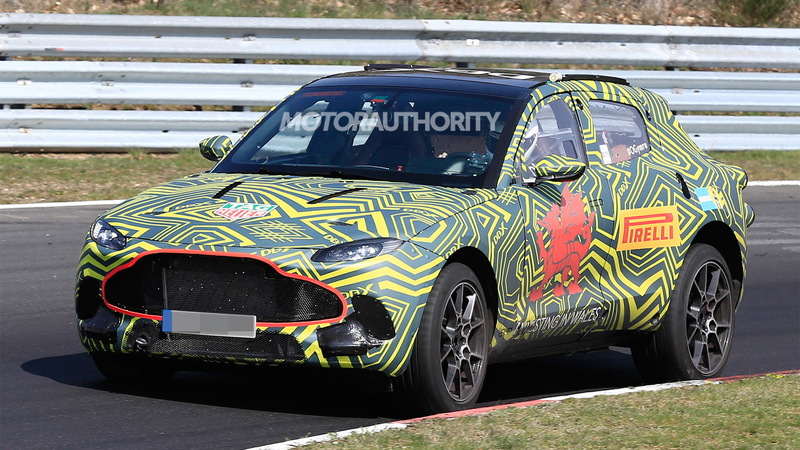 Some readers will recall that Aston Martin also used the DBX name for a 2015 concept previewing the SUV's design. There were rumors the automaker would go with a different name for production, with Varekai being one of the suggestions. Instead, Aston Martin has chosen to stick with DBX, which links the SUV with the automaker's DB line of sports cars. The DBX utilizes a new platform developed specifically for a high-riding vehicle capable of off-road conditions, but the construction is the same extruded and bonded aluminum process Aston Martin uses for its sports cars. Unique to the DBX program is a focus on suspension technology to address the SUV's increased mass, size and purpose. While Aston Martin first imagined the SUV as an electric car, that has changed due to the automaker's revival of Lagonda as an EV brand. The DBX is now expected to debut with a 4.0-liter twin-turbocharged V-8 sourced from Mercedes-AMG. A hybrid powertrain utilizing a new V-6 developed in-house at Aston Martin is also a possibility. 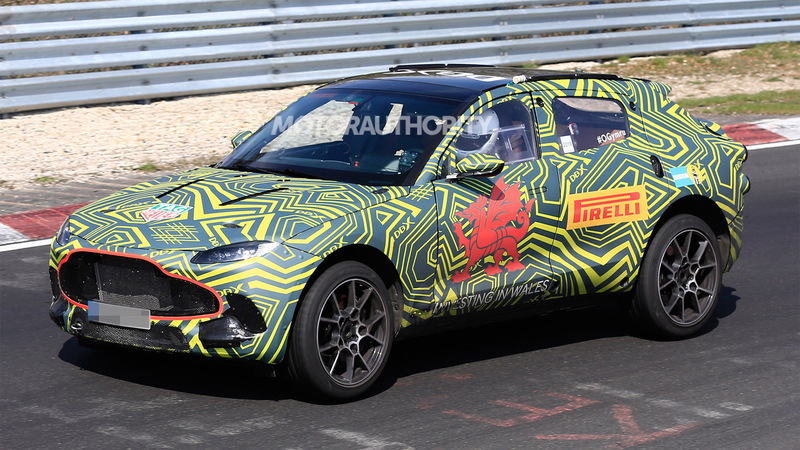 Production of the DBX will take place at Aston Martin's new plant in St Athan, Wales, which later this year will start churning out the Rapide E electric sport sedan. The DBX will also start production this year, and later two Lagonda models, an SUV and sedan, will be added. The DBX is the fourth of seven cars promised under Aston Martin's Second Century plan. The first was the DB11 which has since been followed by a redesigned Vantage and new DBS Superleggera. After the DBX will be a mid-engine Vanquish supercar around 2021, a Lagonda SUV around 2022 and a Lagonda sedan around 2023. Aston Martin will then repeat the seven-car cycle with redesigned models. And along the way we'll also see special edition models like the Valkyrie and 003 hypercars.